The new Chrysler Pacifica speaks for itself with more Class-Exclusive and Best-in-Class features than we can keep track of. The minivan has been a staple family vehicle for quite some time now, and for the most part, people know what to expect when purchasing one. But, what if a brand pushed the envelope and changed the game for what the modern minivan offers now? Welcome to the all-new Chrysler Pacifica. Chrome detail, a bold black grille, and distinct cuts down the sides exude the feeling of perpetual motion just as a sports car would. And accessibility to the Pacifica has no limits with hands-free side doors and liftgate; not to mention a tri-pane panoramic sunroof for a truly expansive experience. Inside, Uconnect® Theater is available to provide your passengers with the perfect entertainment system, while you can enjoy your own tech with a fully-customizable 8.4-inch touchscreen. 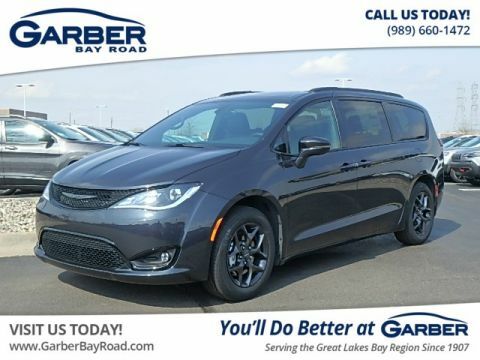 It goes without saying that the new Pacifica is the way to travel whether you’re headed to Saginaw for a movie night or commuting to Bay City for work in the morning. Why would designers of a minivan give so much attention to its appearance? The better question is, why not? Chrome details on the front end perfectly accent the signature Chrysler grille, while sporty wheels give the Pacifica an athletic feel. And, the functionality of the exterior surpasses that of many with hands-free sliding doors and liftgate, as well as a tri-pane panoramic sunroof. Just because it’s a minivan doesn’t mean less attention should be paid to a striking exterior. 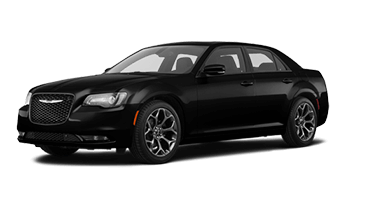 That’s why Chrysler designers created an exterior that doesn’t sacrifice an ounce of style with a bold grille, sleek headlights, and available 20-inch polished aluminum wheel with tech gray pockets to cap it off. It’s time to change the game. There’s something to say about a vehicle that’s recognizable by its headlights alone, just as the new Chrysler is with available LED lower light pipes and headlight bezels that are finished in chrome. Make life a little easier with available hands-free sliding doors that merely require a simple wave of your foot below the sensors to open for your convenience. Drop the hassle without having to drop everything in your hands. 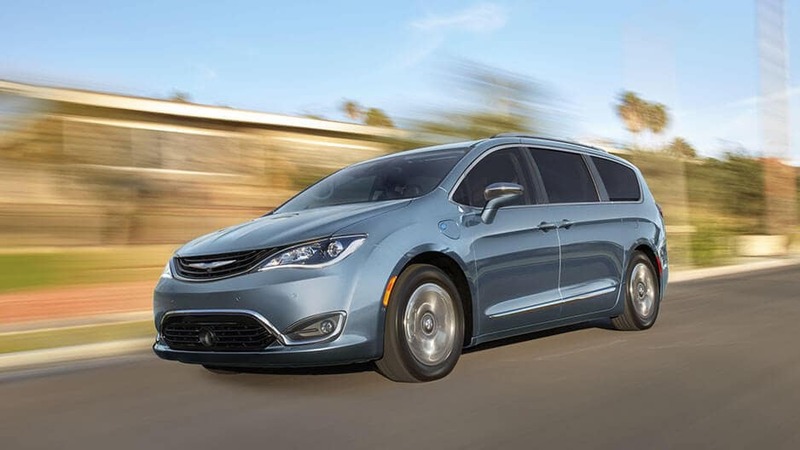 The Chrysler Pacifica is just getting started with hands-free accessibility as push button sliding side door activation is available as well. With this feature, all it takes is a tap of your finger on the door handle and in you go. It doesn’t get much easier than this. Basically, Chrysler wanted to eliminate all frustrations with regards to getting into your vehicle with full hands and kids running about. That’s why the new Pacifica offers an available hands-free power liftgate that opens with a wave of your foot beneath the sensors. You’ve heard of the classic sunroof, and then, the integration of a dual-pane sunroof, but have you heard of the Chrysler Pacifica’s tri-pane sunroof? Talk about big. 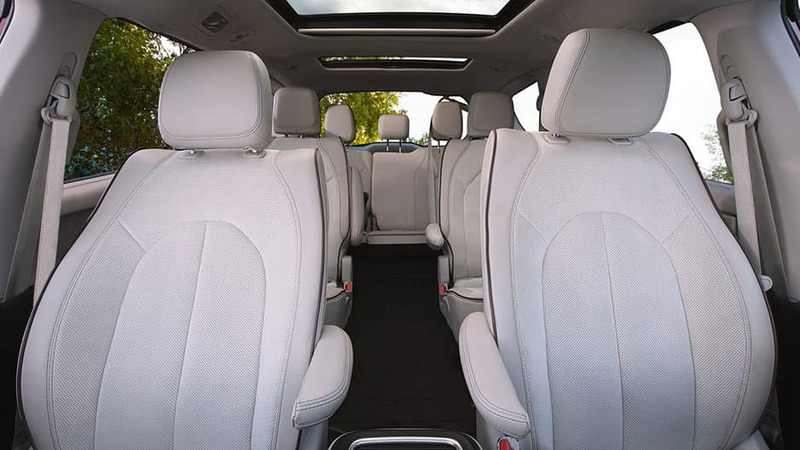 This tri-pane panoramic sunroof affords everyone the luxury of an expansive view of the outdoors – one that your little passengers are sure to enjoy. 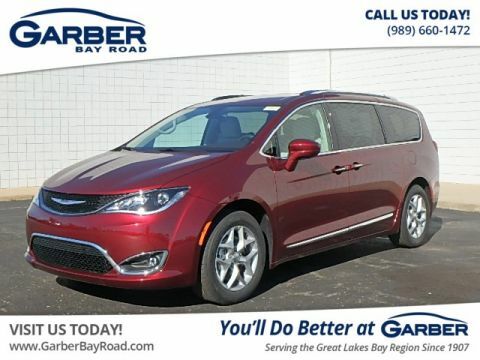 Apparently, the all-new Pacifica likes to go against the grain and stand out in the crowd with multiple class-exclusive features, including the Stow ‘n Go® Seating and Storage System, Easy Tilt Seating, as well as being the quietest vehicle in its class with the most powerful vacuum in the segment. Trust the brand that goes the extra mile in every category. Need some extra space? The new Pacifica is capable of providing that with the Stow ‘n Go Seating and Storage System. With a press of the Stow ‘n Go Assist button, the front seats slide forward for access to the in-floor storage bins. Then, the second-row chairs easily fold into the bins leaving an immense amount of room for you to work with. Opt for the only minivan in its class with this feature – the all-new Pacifica. Avoiding a mess with kids on board is so unlikely that you could assume it’s impossible. Fear not, the new Pacifica features available Stow ‘n Vac powered by RIDGID® which happens to be the most powerful vacuum in its segment. You’ll be able to tackle every nook and cranny with a vacuum that extends throughout the entire cabin so every crumb is accounted for. Take the pain out of squeezing through the second row or hopping into the third row from the trunk with Class-Exclusive Easy Tilt Seating in the Pacifica. Now, all that’s needed is the lift of a lever and the second-row seats tilt forward so your little passengers can hop right in. Heated front seats come standard which is always the perfect remedy for those cold commutes to work or school drop-offs. You can combat overly warm days just the same with available ventilated front seats, so you and your partner can keep your cool. The new Pacifica offers seating for up to eight passengers. In the event that you need to increase your cargo capacity, power folding third-row seats are available to provide a flexible amount of space. That way not only can you accommodate more, but you can do it with ease. You have enough noise to deal with right in the cabin of your vehicle which is why the Pacifica wants to rid of any extra unnecessary sounds with Active Noise Cancellation. And on those solo trips, your peace of mind will surely be rejuvenated in the quietest vehicle in its class. Entertainment, parking assistance, and unparalleled sound are integral features of the all-new Chrysler Pacifica. You and your passengers will feel right at home with Uconnect® Theater and an 8.4-inch touchscreen, while a 20-speaker audio system is the frosting on the cake. And when it comes to parking, three features are available to help ease you in-and-out of every tight maneuver. Consider the available Uconnect Theater your babysitter on the go. The system features dual 10.1-inch HD touchscreens with Blu-ray™ player, dual HDMI inputs, wireless headphones, Bluetooth® remotes, as well as downloadable games and apps. How about that for equipped? 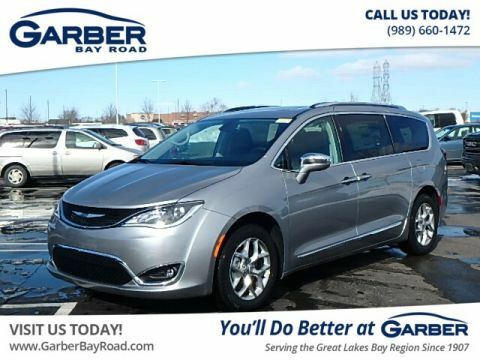 The rear passengers can’t have all the fun which is why the Chrysler Pacifica features an available 8.4-inch touchscreen with a fully-customizable home screen. And if you want some assistance without taking your hands off the wheel, use Siri® Eyes Free to navigate your touchscreen. Maneuvering through tight spaces can be nerve-racking which is why the Pacifica offers an available 360° Surround View Camera. This feature uses four cameras around the vehicle to display a bird’s-eye view on your touchscreen so you’ll never have to question those hard-to-see angles again. Remove any doubt you may have when parking by opting for the available ParkSense Rear Park Assist System with Stop. 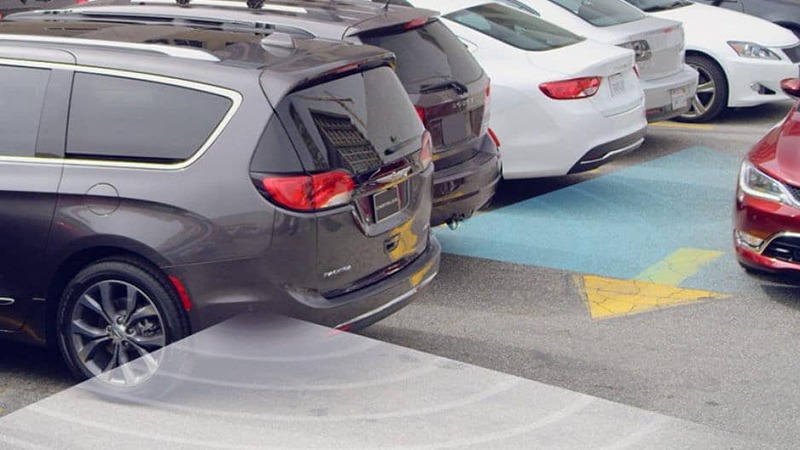 This technology provides visual and audible warnings if sensors in the front and back detect the Pacifica closely approaching an object, and if a collision becomes imminent, light brake pressure may be applied. 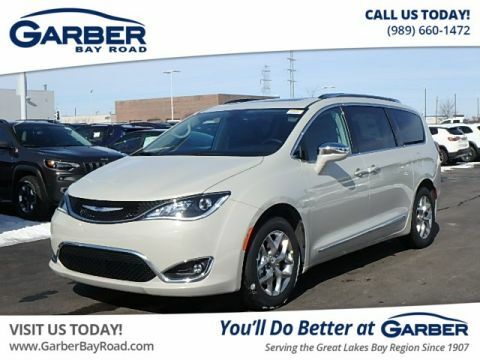 Yet again, another feature unique to the Chrysler Pacifica is the available Class-Exclusive Parallel and Perpendicular Park Assist System. On-screen instructions prompt you for gear changes, braking and accelerating, while the Pacifica controls the steering right into the parking space. You may have experienced eight speakers or maybe 12, but have you experienced the power of a 20-speaker sound system? 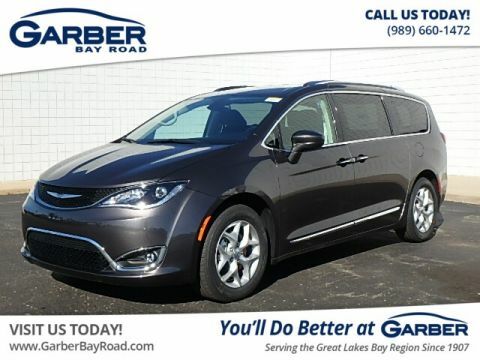 If not, the new Chrysler Pacifica offers an available 20-speaker Harman Kardon® Premium Surround Sound System for audio that is no longer just listening, rather an experience. Add one of the most renowned sources of music to your Pacifica with available SiriusXM Satellite Radio that comes with a one-year subscription. Heighten your awareness with the collection of adept safety features offered in the all-new Chrysler Pacifica. Whether it’s lane drift, vehicles in your blind spot, or a potential collision ahead consider yourself protected on all fronts in the Pacifica. If you are approaching a vehicle too quickly, available Forward Collision Warning will provide visual and audible alerts. If you fail to brake from the warnings, the Pacifica may apply brake pressure to avoid or minimize a collision. Lane drift seems to happen to everyone at some point on the road. The Pacifica is prepared for these situations with available LaneSense Lane Departure Warning with Lane Keep Assist. This system provides warnings and helps guide you back into your lane. 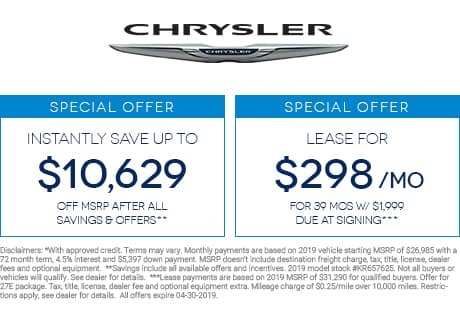 It’s just another way the Chrysler Pacifica looks out for you. It’s easy to change lanes without turning and looking, but one of those times may not work out in your favor. Let the Pacifica handle those hard-to-see places with the available Blind Spot Monitoring System that alerts you upon detecting another vehicle in your blind spot. Think about a busy grocery store parking lot and how hectic it can be to get out of your parking space. And not only is it chaotic, it is also ripe for disaster. Available Rear Cross Path Detection looks out for approaching vehicles from either side; that way, you can feel confident when the coast is clear. Available Adaptive Cruise Control with Stop and Go allows you to set your following distance between you and the vehicle ahead, and then maintains it. The nifty part of this feature is that it works anywhere from zero mph to highway cruising speeds which means less work and frustration for you. There is a first time for everything such as America’s first-ever Hybrid Minivan courtesy of Chrysler. And, staying consistent with other class-exclusive features, the Pacifica proudly shows off a Best-in-Class towing capacity and an award-winning engine that comes standard. The new Pacifica doesn’t need people to speak for it – it speaks for itself. Standard for the new Pacifica is a powerful 3.6-liter Pentastar V6 engine that has more gusto than you would imagine. It accelerates quickly and seamlessly with a nine-speed automatic transmission, and it achieves an impressive 28 mpg highway. Let’s just say it’s one of those features you would expect to be available, not standard. 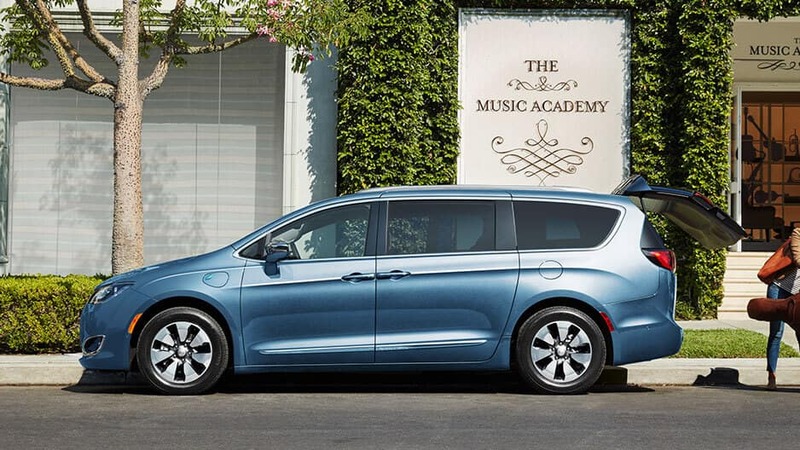 For all of those long road trips and inconvenient stops at the gas station, Chrysler has an answer – the Pacifica Hybrid. It boasts a 566-mile total driving range, 33 miles on a single electric charge, and 84 MPGe when using both electricity and gas. Now that sounds like a good way to save some money. When you think of a minivan, there’s a good chance that towing capacity isn’t the first thing that comes to mind. 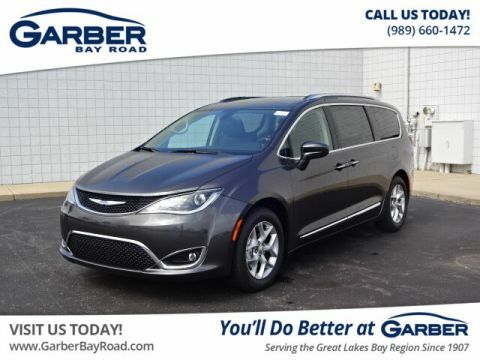 However, the new Chrysler Pacifica is here to update that notion by showcasing a Best-in-Class towing capacity of 3,600 pounds so you can bring along more than you expected. In the event of an accident, the only thing standing between you and your passengers and the other vehicle, is the outer shell of the Pacifica. Chrysler designers paid close attention to this detail and ensured a strong safety frame by utilizing dual-phase, high-strength lightweight steel. Impact protection is at a maximum in the new Pacifica. Maintain the utmost control and stability with standard Electronic Stability Control on the all-new Pacifica. This feature helps you stay on course by adjusting the throttle and applying brake pressure if necessary. Chrysler Is Serious About Putting Fear in the Competition. The most eye-catching vehicles on the road are likely sports cars for their athletic nature, but what if a minivan could embody that role? The all-new Chrysler Pacifica has taken major strides in that direction with looks that simply won’t quit. However, standing out in the crowd demands more than just looks, it demands relentless performance. That’s why the Pacifica features a 3.6-liter Pentastar® V6 engine that comes standard, and an available Pacifica hybrid for unmatched efficiency. You may never consider the towing capacity of a minivan as it may seem irrelevant, but when it boasts Best-in-Class towing capacity of 3,600 pounds you might change your mind. But, that’s not the only place where the Pacifica is strong. A collection of the most technologically sound safety features is available, including LaneSense®, ParkSense®, Forward Collision Warning, and more. Ensure your peace of mind for every trip you take with high-quality performance and safety features in the new Pacifica. 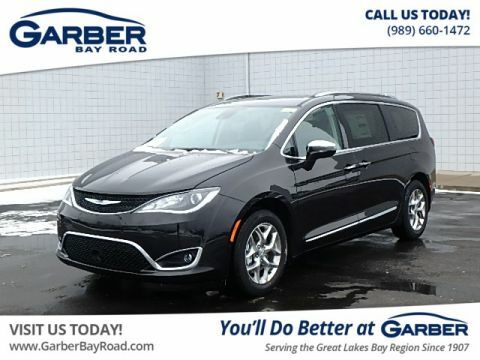 Make dropping the kids off at school in Saginaw easier than ever by coming down to Garber Chrysler Dodge Jeep RAM in Saginaw where our professionals can help you into a new Chrysler Pacifica today!